In her book At the Existentialist Café Sarah Bakewell writes that Simone deBeauvoir understood that even as she and her intimate community judged the past, so would she and her communities “be judged by the criteria and values of those in the future. Bakewell quotes Jean-Paul Sartre who speaks autobiographically in his book Saint Genet. Sartre acknowledges that he and his generation would be judged by the future: “We feel that we are being judged by the masked men who will succeed us . . . our age will be an object for those future eyes whose gaze haunts us”. What they mean is that the future always will measure the past not by the standards of that past but by those that are held in the future. Beauvoir and Sartre were aware that they could have no control over this judgement but must instead act in good faith in the present. 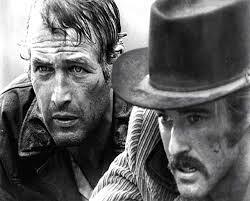 I was reminded of the 1969 film Butch Cassidy and the Sundance Kid. Butch and Sundance are running from the posse that has been organized to bring them in after a botched train robbery. Butch had used too much dynamite in his attempt to open the railroad safe that had been reinforced by agent Woodcock following a previous train robbery by Butch, Sundance and the gang. This time Butch’s dynamite had slightly exaggerated the difficulty of the task and had not just blown open the newly fortified safe door but had splintered to bit the entire train car, safe and all. In the explosion the bank’s money floated about chaotically in the wind touching down like leaves on the ground. Butch and Sundance look up from the confusion to see on another track a powerful stream of black smoke billowing from the smokestack of an advancing dark train engine. As the train noisily comes to a screeching halt, the doors of the car slam open and atop their horses out jump the Super-posse, organized to hunt down the gang. Butch and Sundance gallop desperately away. Looking back from atop their horses they look behind them. In the far distant the pair see the dust raised by the galloping horses of the posse heading in their direction. Sundance says to Butch, “They’re very good!” The pair head hastily into the open and difficult terrain in flight from the tightly bunched and unwavering chase by the members of the Super-posse, and at least three times Butch turns to Sundance and question, “Who are those guys?” Butch Cassidy and the Sundance Kid are chased by the faceless and inexorable future that would punish them for their acts in the present. I think that is the point. In a sense the future always hunts down the present. Butch says, “How many of ‘em are chasing us?” and Sundance says, “All of them!” There is no escaping the gaze of the future that is, like the Super-posse, faceless, relentless, inscrutable: ultimately hostile. Sartre and Beauvoir broke with Camus over the issue of commitment, but I think the position of Father Paneloux in Camus’ The Plague speaks to what stance one might take aware even still of the judgement that must inevitably come upon the present from the future. Despite the horrors, demands and inevitability of the plague Paneloux says, “You must be the one who stays.” The present should always be the concern. Like Walter Benjamin’s angel, looking back to the past we are blindingly blown into the future. Camus’ Paneloux insists we stay engaged only in the present. I never did understand what they meant, though I always did feel the weight. I’m still not exactly sure why Fanny sent me out, but I think it might be nice to return to her even though, I think, it is not shelter from the storm she offers. Every morning I awaken to another horror. Today I read that a suicide car bomb in Damascus has killed eight, and recognize that as children there die, our government hasn’t a clue how to intervene in this conflict. This past week a doctor prowled Bronx-Lebanon hospital with a gun. In the end, two people were dead, including the gunman who shot himself, and six more were wounded. Early Saturday morning seventeen people were wounded in a shooting at a club in Little Rock, Arkansas. but gun control is anathema to the Republican majority. The latter part of this week was despoiled by Trump’s repulsive and sexist attack on Joe Scarborough and Mika Brzezinski, and the attempt by Trump’s craven and absurd lackeys to actually defend his actions. And this is just the some of the horror during one week at the end of June 2017. There was blaring across the pages of my newspapers the usual reports of venal corruption and corporate greed. There was news of the Republican health care bill that promises only hardship and hardship for those in need and extra money for those who really have little need for it. The week prior the news of the shooting at a baseball diamond consumed the media as did the normal amount of dreadfulness and political obscenity led in the charge by the President of the United States. And just this morning Trump posted a video of himself attacking, violently wrestling to the floor and then pummeling an image of a man with the logo for CNN as a head. Bob Dylan said, “It’s not dark yet, but it’s getting there”: to my mind, for all intents and purposes, it is dark now. Very dark and very dangerous. I wonder what the effect of the steady violence might be having on our children: of course, there are children everywhere! I do not think that many of them could avoid the daily reports of violence and mayhem in the world and in the nation. Few could avoid reports of the President’s obscenities. For the children, newspapers, radio, television and social media are ubiquitous and central to the daily life of many of the young; there is really few places to hide. I cannot begin to speak of those who live daily amid the violence of our time though I try to imagine the hopelessness which they experience and the energies that are required to just barely survive by attempting desperately to keep on keeping on. The effect of the constant assault on the consciousness of the young must result in the experience of trauma: the interruption in being. Suicide, of course, is one response to the trauma. There are other means of dealing with this experience of this trauma: the development of a posture of reckless bravura that strikes out with violence against the violent, invasive environment the daily confront; a sensory withdrawal into the self that results in a blank coldness; or the creation of a hard, protective shell that wards off future assault and feeling. Another response might be to mirror the behaviors they observe in the adults: to lie, cheat, steal and commit violence. If bullying has become an issue on the internet, then the bullying perpetrated by Trump the internet sanctions this violence by the children. I recently saw a picture of six-year old Ruby Bridges entering the William Frantz Elementary School in 1960 escorted and guarded by Federal marshals. As she climbed the stairs a mob of white mothers screamed curses and epithets at this child and then pulled their own children from the school so that they would not have to be educated alongside an African-American child. White teachers refused to teach this six year old, and Ruby Bridges spent the year as a sole student at that school. I read Trump’s tweet attacks; I witness his ignorant, self-serving, false claims for his abilities and achievements; I read the daily papers and contemplate the cruelty and stupidity of the Republican majority (Paul Ryan excusing the President because he is ‘new to the job’). I see Trump’s dangerous incompetence that is fueled by a raging narcissism. Behind that very brave six year old I see those white parents led by the President of the United States and the Republican party and its repulsive leadership. I despair for the future. It is dark now.